It glistened in the soft morning light. The single tear that fell from my daughter’s eye as she stood in our bedroom doorway. “Mommy, she didn’t come!” breathed my eight-year-old despondently. Then that single tear turned into a torrent. How did we let this happen? Quickly I reviewed the night before. Exhausted by my first Girls’ Night Out in three months, I had gone to bed at 10pm (don’t judge) and left the money with my husband. He simply fell asleep before remembering his Tooth Fairy duties. There more extenuating circumstances. Our daughter’s tooth had been wiggly for merely a day. That was extremely short notice vs. those teeth that hang on by a (nasty!) thread for weeks. Plus, she was eight now and it had been months since she’d lost her last tooth. In fact, our oldest child, 12, had finished losing his baby teeth long ago. My husband and I were definitely rusty in our duties as well as in the twilight of our Tooth Fairy career, eyes on retirement. Still, the plain hard truth was that we blew it. The Tooth Fairy didn’t come. The dew was too heavy. Her wings got wet and she couldn’t fly. The Tooth Fairy was on vacation and the substitute Tooth Fairy didn’t know what she was doing. Spreadsheet error. Your tooth was projected to come out on Friday so she wasn’t ready when it came out on Monday. Some Tooth Fairies like snacks. Leave one out tonight and she’ll probably come. Oh, look, she dropped the money on the floor over there. She must have wanted you to keep your tooth as a souvenir! She ran out of money and will be back tonight. She’s a tiny fairy so she can only carry so much. My daughter seemed to calm down after she spent the day listening to our reasons why the Tooth Fairy did not come. Of course, all was made right with the world the following the morning when, hallelujah, the Tooth Fairy DID come. Moms and Dads, may your Tooth Fairy always remember to come. 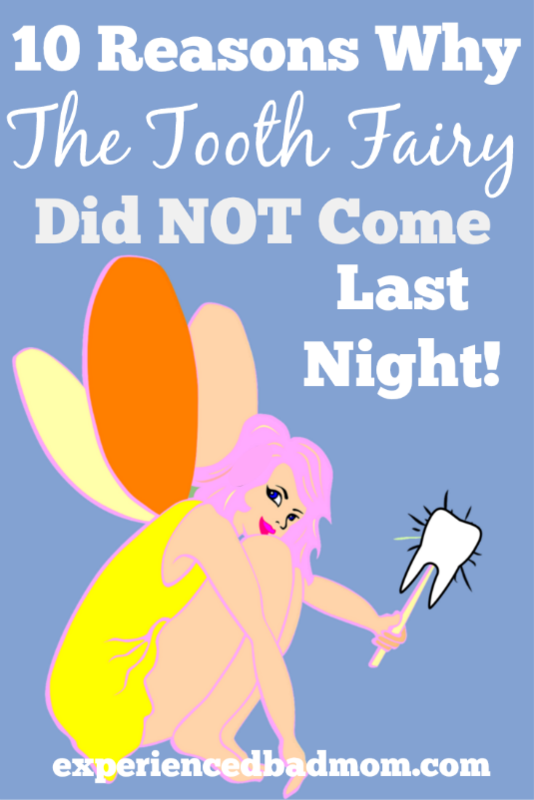 In case she doesn’t, may you find these reasons why the Tooth Fairy did not come to be useful! OHmygosh I LOVE THIS SO MUCH!!! “Oh, Fudge,” he said. Only he didn’t say Fudge. <— LOL. Those are awesome reasons… I pinned this so I can refer to them. Oh too many times we have been in this 'situation'. Thanks Chris! So many people have told me it’s happened to them, too. I hope it’s handy to have a list of reasons. I aim to help! Ugh. That horrid feeling upon hearing the plaintive “she didn’t come.” Katy, where were you and your ten reasons ten years ago? And 15 years ago? Ugh. I was such an idiot. I purchased the cutest tooth fairy pillow EQUIPPED WITH BELLS at a craft fair when my two were wee. Fool me. The delighted child who just lost a tooth, slipped the tooth in the pillow and tucked it under their pillows. Yes. JINGLY JINGLY JINGLY each time the tooth fairy swapped money for the tooth. Such a delight when the tooth fairy forgot to visit! She tried to do her duties while the sobbing child choked down his/her breakfast. JINGLY JINGLY JINGLY. Once was enough. All subsequent late visits were done the following night. The Tooth Fairy has forgotten us many times. It’s awful I explain that he never got our change of address card. Haha. I’m sure I’ll forget one day. I’ll probably say the tooth fairy was too tired. Or a bunch of teeth fell on top of her. She’s working on climbing out. Ha ha ha! That would be funny. #3 is my go to. It’s always true and it always motivates them to do at least a little bit of cleaning!! My daughter has a messy room but a fairly clean path to her bed, which makes me laugh. It’s like a Tooth Fairy landing strip. Oh gosh. Good job, Mama! My son’s had one loose tooth for more than a week now and I’m still not prepared. It’ll be his very first one so I’d better not forget right? Gah. Love this so much! Kristi Campbell recently posted…The 80’s. Or, When I Was 19 and Knew Everything. Enjoy those first, though! It’s fun. Hahaha, oh no! Man, it’s a lot of pressure to be a parent. I remember losing a tooth on vacation once and yet someone the tooth fairy (aka my mom) somehow thought to bring something. I don’t anticipate being that organized when the time comes! Love this excuses, I will keep this in mind for the inevitable day when the tooth fairy does to make an appearance at our house. 🙂 I can’t decide which reason to pick as a favorite and have to choose all 10! I’d add that their network was down and they got the message too late! Heheheh. Oh Fudge! Hilarious. ♥ I actually came to read your “nineteen” post…I think 🙂 Hugs, Katy! The network is down – perfect for the smartphone generation! Thanks for the visit, Vidya. Ahahaha awesome and hilarious post — found you via Traffic Jam weekend linky, congrats on the feature! If you felt like coming by and linking up at the Friday Frivolity party I host, I would love to have you join us!! So glad you came by to link up!! JUST as funny a post the second time!! Nice save. I especially like the messy room one. Classic case of misdirecting the blame/guilt! It’s not my fault the Tooth Fairy didn’t come, it’s YOURS! I have had this same thing way too many of these to count! Our tooth fairy is a complete flake. It’s not uncommon for her to take 2-3 nights to show up. I think that reason #3 may be why. Thanks so much for sharing at the #happynowlinkup!